Thank you for visiting our website. If you are new to the area and are looking for a place to worship and connect with other believers dedicated to sharing the gospel of Jesus Christ with those who are lost, you’ve come to the right place! We would love to have you worship with us! At Praise Temple, you will discover dynamic worship, a solid message, and people who genuinely care about the Lord and others..
Sun. Prayer – 9:00 a.m.
Sun. Worship Service – 10:45 a.m.
God’s blessings come in various forms and we want to share these blessings with you. It may be pictures, praise testaments, things that make us chuckle, family recipes, fun activities, songs/poems you wrote, or just a sincere prayer request. All are welcomed to be shared in the Praise Report. 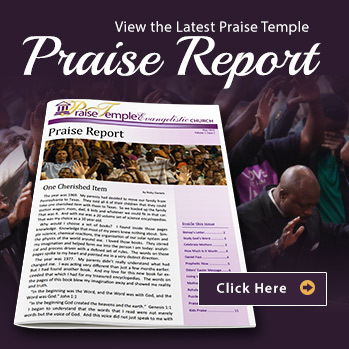 If you are a member of Praise Temple and would like to contribute to future monthly newsletters, please submit your articles by the 3rd Sunday of each month to Bro. Ricky or Sis Sherri Daniels atpraiserpt@gmail.com. Don't Miss the Rehoboth Fellowship of Christian Churches and Ministries 2018 Convocation!